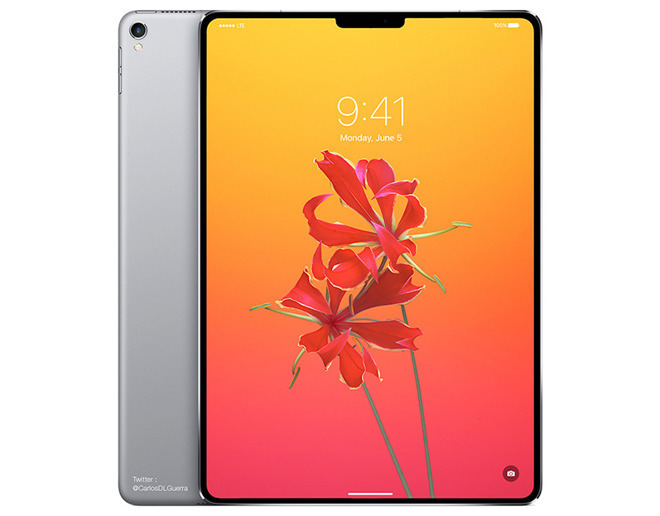 Apple's anticipated iPad Pro refresh will see both the 10.5- and 12.9-inch models shrink in some dimensions, but also lose their headphone jacks, a report claimed on Friday. The 10.5-inch model will go from 250.6 x 174.1 x 6.1 millimeters to 247.5 x 178.7 x 6, according to Japanese site Macotakara. The 12.9-inch device will allegedly switch from 305.7 x 220.6 x 6.9 millimeters to 280 x 215 x 6.4. Those specifications would be consistent with multiple rumors that Apple is planning to bring the Pro line closer to an edge-to-edge display, akin to the iPhone X. The absence of a headphone jack hasn't been strongly hinted at however, and Macotakara further says that Apple won't bundle Lightning-to-3.5mm adapters, which might make for an abrupt transition. Another potentially dubious claim in the report is that while the new Pros will adopt Face ID — something that has been asserted repeatedly — they won't support recognition in landscape mode. That would cause trouble, since many people use iPads primarily or exclusively in that orientation, especially if they own a keyboard. Finally, Macotakara indicates that Smart Connectors will move to the "lower rear side" of iPads, near their Lightning connectors. Apple is expected to ship its new Pro models sometime this fall.